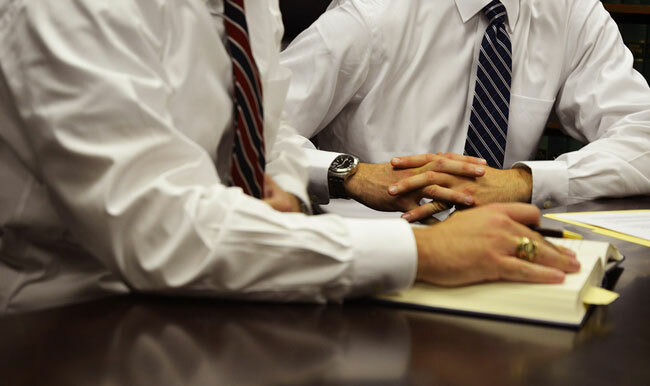 Our attorneys established the law firm of Anderson, Moore, Bailey & Nowell, LLC to provide compassionate representation for the hardworking men and women of the Upstate. We understand that bad things happen to good people. When you hit a bump in the road, be it due to injury, auto accident, marital problems, or an arrest, the attorneys at Anderson, Moore, Bailey & Nowell, LLC are here for you. Although our attorneys are licensed to practice throughout South Carolina and have represented clients in various counties around the state, the firm’s practice is generally focused on the Upstate counties of South Carolina. This firm has deep roots in the Upstate region. Patrick Anderson, Travis Moore, and Vic Bailey all grew up in Spartanburg County. Mark Nowell moved to Spartanburg, his wife’s hometown, as soon as he graduated from law school. Our lawyers are committed to their community and it shows. They are heavily involved in various civic organizations and non-profits that seek to make the Upstate of South Carolina a better place to live, work, and raise a family. 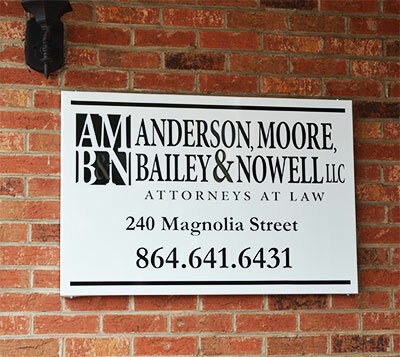 If you’ve hit one of life’s bumps in the road and need a lawyer who will listen to your problems, consider the options, and work for a beneficial resolution, call the attorneys of Anderson, Moore, Bailey & Nowell, LLC today at 1-888-234-2483 or (864) 641-6431 for a consultation.